Yes, it’s the same cover again. 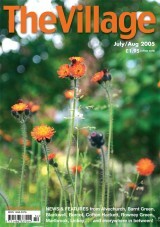 . . that’s because we used to do a combined July/August magazine back in the day! We reported that teenage magician Christian Fletcher, whose family ran the Swan pub in Alvechurch, had landed a job performing close-up magic in Salou, Spain. Elsewhere, local poet Mike Bannister shared more reminiscences of his childhood in wartime Cofton, and Bob Dale, of the Campaign to Protect Rural England, celebrated 50 years of the Green Belt. 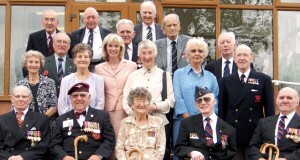 * More than 60 veterans enjoyed the Alvechurch Ex-Services Association’s anniversary dinner at Beoley Village Hall. Guest of honour, MP Julie Kirkbride, handed out an Armed Forces Services badge to each of the WWII veterans at the event. 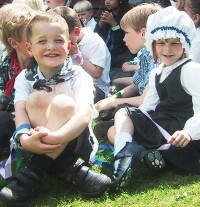 * Blackwell First School pupils entered into the spirit of a Victorian Day by dressing up in 19th-century costumes to learn about the lives of Victorian children. The day was rounded off with a traditional dance around a maypole.